This week in Studio One we get to welcome the fabulous Suzy Bogguss. I’m not sure if Suzy’s been round this way recently but I know this will the first time she’s visited us in Glasgow. The last time we met she was in great company in the studio we use when the AC goes to Nashville. Along with Matraca Berg and Gretchen Peters, Suzy was part of the trio “Wine, Women and Song.” Looking back now I realise that session was longer ago than I’d imagined….2009! Suzy is a great country singer who earned her stripes when she used to work at the theme park which became ‘Dollywood.’ Singing there encouraged her to record her own music and the rest is well….history. Suzy became a country star singing some songs you’d know even if you’re unfamiliar with her back catalogue. Nanci Griffith’s ‘Outbound Plane,’ John Hiatt’s ‘Drive South’ and her first radio hit, Merle Haggard‘s ‘Somewhere Between’ were all hit records. However it’s that Merle track where we come into the story. Suzy Bogguss’s new album is an all Merle affair. 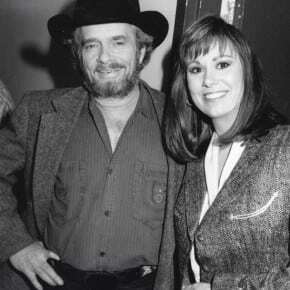 Called ‘Lucky’ it’s Suzy’s take on many of Merle Haggard’s most famous songs. ‘The Bottle Let Me Down,’ Silver Wings,’ – they’re all there. Great versions too which almost surprise you coming from a females voice. Suzy would probably say that’s why she did the project. However we don’t need to guess anything. She’ll be with us in the studio and accompanied by her touring band we’ll spend the second hour of this week’s AC in her company. That, my friend, is a quality Friday night in. We’ll also celebrate some great new music. Listen out for recordings from Sion Russell Jones, Loretta Lynn and Robert Ellis. This week I went on a very long car journey and I’ll get a chance to tell you a little about that too – it has led me to some excellent records. You can join us for all of this on Friday evening at five past eight on BBC Radio Scotland.